Author Mitchell Zuckoff, a professor of journalism at Boston University, is heading to Greenland this summer to help recover three World War II heroes entombed inside a glacier since November 1942. Two of the men were Lieutenant John Pritchard and Radioman Benjamin Bottoms, crewmen of a Coast Guard amphibious biplane who were trying to rescue survivors from a B-17 bomber that crashed during a search mission. The third man was the radio operator of the B-17, Corporal Loren Howarth. 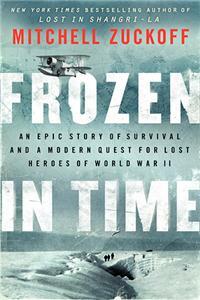 Zuckoff described the historic events and the search for the lost plane in his most recent book, "Frozen in Time: An Epic Story of Survival and a Modern Quest for Lost Heroes of World War II." In this blog, he'll be documenting the public-private partnership to carve through thousands of tons of ice to fulfill the U.S. military's promise to "leave no man behind." Follow the stream below for updates on Zuckoff's travels. You can also follow him on Twitter @MitchellZuckoff.